Flu Alert provides you with up-to-date information related to the flu, straight from the Centers for Disease Control and Prevention. Flu Alert includes a handy flu symptom checker to help determine if you have the flu (Note: It is no substitute for a doctor). Flu Alert provides a wide range of CDCP provided information. Flu Alert also helps you locate local pharmacies that typically carry flu vaccinations. Remember, vaccination doesn't just protect you from the flu, it also helps prevent the spread to others at risk. 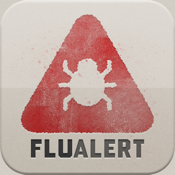 Flu Alert also provides you with the current weekly flu activity directly from the CDC.